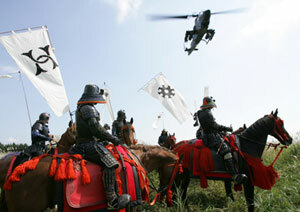 (left) Yosuke Eguichi leads his troops, and (right) one out-of-place bird in Samurai Command: Mission 1549. The Skinny: While this glossy, CGI-laden remake of 1982's G.I. Samurai is strangely watchable, it's not nearly as fun as a B-movie should be. If you like time-travel and/or the idea of army men battling it out with samurai, then this goofy flick might just win you over. Review by Calvin McMillin: Let's get this out in the open first: Samurai Commando: Mission 1549 is by no means a good movie. For starters, it's blandly executed, and even worse, the plotholes are big enough to sail an aircraft carrier through. And yet, somehow, the film still finds a way to draw you into its story, even despite the often blatant mediocrity on display. The film kicks off near Mount Fuji, as the Japanese Self Defense Force is testing out a brand new, technologically-advanced magnetic shield. Of course, the gadget goes haywire and sends Col. Matoba (Takeshi Kaga, AKA Chairman Kaga from Iron Chef! ), his squad, some military vehicles, and a whole cache of weaponry back in time to the year 1547. Over the next two years, it's discovered that the group's presence in the past is disrupting the space-time continuum, causing black holes to rip through the fabric of reality, threatening to swallow not only Japan, but the entire universe in the process. Obviously, this is a job for Marty McFly. But with the former Alex P. Keaton nowhere to be found, the top military brass turn to a former soldier named Kashima (Yosuke Eguchi), who has long since left the military and taken up employment amongst the civilian folk. What's so great about Kashima? Well, he was the only soldier to have mastered the colonel's war games, and the government feels that somehow makes him best-qualified to assist on the mission. On the urging of total non-love interest Rei Kanzaki (Kyoka Suzuki) and a time-displaced samurai (Kazuki Kitamura), Kashima reluctantly agrees. Unfortunately, when his troops find their way to the Warring States Period, they discover that Col. Matoba is altering the timeline on purpose. It seems Matoba accidentally killed Nobunaga Oda, and has since assumed the famous leader's identity in the hopes of turning Japan into the world's very first superpower. Of course, with Matoba unwilling to give up his quest and return to the present day, all hell breaks loose between the two battalions. Swords are drawn, tanks start blasting, and arrows fly, as mentor and student find themselves set on a collision course of epic proportions, from which only one will walk away. Dramatic, huh? I know all of this sounds tremendously exciting at face value, but it's not nearly as entertaining as one might hope. These types of B-movies live and die on "cool moments" - the iconic visual, the memorable character, or the amazing action sequence, just to name a few. But considering how the movie is shot, staged, and lit, I often felt like I was watching an unnecessarily bland Sci-Fi Channel Original Picture, rather than the big screen spectacle it so clearly could have been. And that's the movie's biggest problem: there's hardly anything remarkable about it besides the concept, which is executed with an odd charm and a workman-like sort of competence, but even that is only enough to get by. Where are the vicarious thrills promised by the gonzo plot? It's not often that a contemporary film makes itself readily available for Mystery Science Theater 3000-style mockery, but Samurai Commando somehow defies the odds. Exactly how the displaced Japanese soldiers were able to construct a working oil refinery in the space of two years is beyond me, and the faux-Nobunaga's master plan is one for the ages. With his knowledge of future events and his personal wish to make Japan the strongest of nations, exactly what would you expect him to do? Use his advanced firepower to dominate nearby nations? Or maybe invade and colonize America long before the British arrive? Nope on both counts. Get this: Col. Matoba's dastardly plan involves dropping a huge nuke into Mount Fuji, causing a volcanic eruption that'll blast the country to smithereens. Why? He hopes to reform Japan from the rubble. Really. Dr. Evil has better plans than this.